StartupNetwork.USStartups and Investment ProjectsSubscription and one-time donations. Smart AI index. We help to subscribe to a charity for favorite nonprofit organizations, churches, and funds. With us, donors can support any company anywhere. All donor's one-time and monthly donations will now be in one place. Easily add new funds, manage subscriptions, change the number of donations. 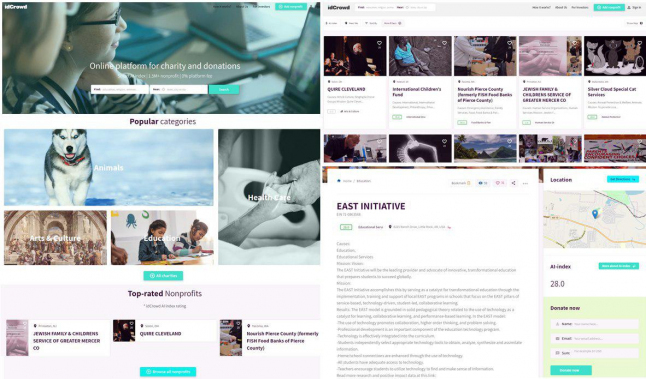 idCrowd.co is not simply an online platform for charity. idCrowd.co is changing the way the world gives! Our database already contains about 1.5M non-profit organizations in the United States and a self-developed manual artificial intelligence index for evaluating company ratings.